dating web sites A Masbate-based Catholic priest on Saturday asked to President Rodrigo Duterte to make good his promise to kill as many criminals as he could. Gränna “President, marami kaming ipapapatay sa iyo,” Fr. Lorenzo Bautista, rector of the Masbate Cathedral, said in his homily. 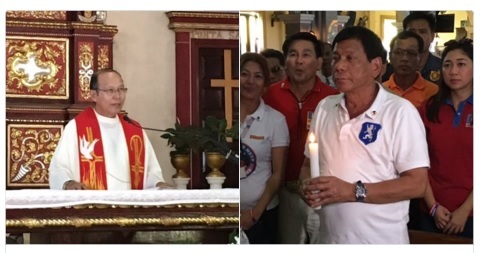 Sandefjord As the President was holding a lit candle inside the church, the rector said he approves of Duterte’s proposal for a tough proactive approach to combat criminality and corruption. Asked later if he was being serious about having criminals killed, Bautista said that he was just joking. “It is a joke. Pero kung marami dito ang dapat patayin na involved in the criminalities, corruption, and drugs, I am with him (Duterte),” the priest said.